Over the weekend I went to Chicago to attend the Brands and Bloggers Summit. As an expecting mom with 2 young children to take care of I don’t get out much to go shopping for myself. I also don’t have a lot of money to spend on maternity clothes. But Borrow for Your Bump was gracious enough to sponsor my maternity wardrobe. Borrow for Your Bump is a site that lets you rent designer maternity clothes for a fraction of the cost of purchasing them. (And if you really love the item you are renting you can buy it!) I love this idea and think it’s particularly useful especially if you have a special event to attend, like a blog conference, but don’t have a big budget to spend. 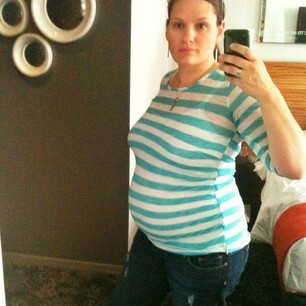 On day 1 I went sightseeing around Chicago and wore this super cute Nolan striped t-shirt by Nom and comfortable Jimmy Jimmy in Rebel by Paige maternity jeans. This outfit is totally my style, comfortable and casual. On day 2, the day of the conference, I stepped outside of my comfort zone a little with this Coral Chiffon Print top by Lilac and was very surprise by how much I loved it. 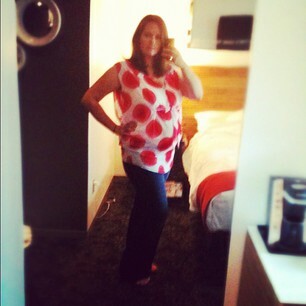 I received many compliments on this top and will certainly be wearing it again. I paired it with a comfortable pair of Paige Jeans. Later that evening I attending the after party and wanted to dress up a little so I wore the Ink Print Maxi Dress by Lilac. I loved this dress. It’s so comfortable and so flattering. One of my favorite things about renting maternity clothes is it affords you the opportunity to try out clothes you like but might be afraid to purchase. I often go for very practical and timeless pieces and steer clear of trendy maternity clothes just for the sake of my investment. But you can go a little wild an rent clothes you might not actually purchase but would love to wear for a short time. If you are pregnant or expecting to become pregnant at some point you should totally check out Borrow for Your Bump! 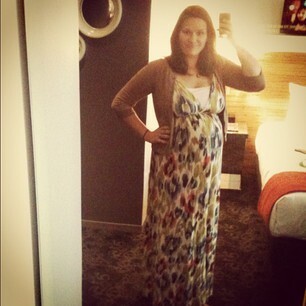 A huge thanks to Borrow for Your Bump for being my maternity sponsor for the Brands and Bloggers Summit this year. They supplied me, free of charge, with all of the clothes featured above. The opinions are my own and not influenced by the company.